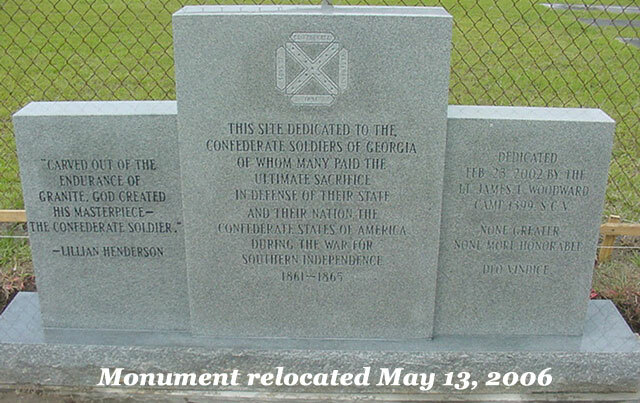 The monument to Confederate Veterans on Georgia 247 Connector was dedicated June 24, 2006 at 4:00pm. Memorial engraved bricks at the monument and information about the dedication are posted here. SCV Camp 1399 maintains several cemeteries in central Georgia and honors the Confederate Veterans buried there with annual memorial services. Our Camp's namesake, Lt. James T. Woodward, is buried in Bibb County and a memorial service is held annually at the Woodward Cemetery on Hartley Bridge Road. Camp 1399 is the custodian and maintains the Stevens Street Cemetery (aka Bason Cemetery) in Warner Robins and holds an annual memorial service (traditionally the Friday before Confederate Memorial Day April 26th) to honor the Confederate veterans buried there. The cemetery was abandoned and neglected when Camp 1399 secured custodianship of the cemetery in 1984. See additional photos on the Memorial Day page. This site dedicated to the Confederate Soldiers of Georgia of whom many paid the ultimate sacrifice in defense of their state and their nation, the Confederate States of America, during the War for Southern Independence, 1861-1865. Honor a Confederate Veteran with an Engraved Memorial Brick! SCV Camp #1399 has paved the area around the monument with memorial bricks engraved with the name, unit and county of Confederate Veterans. Southern Heritage supporters may purchase a brick with the name of a Confederate Veteran they choose or the Camp will nominate one for them. All brick buyers will receive a framable Certificate of Appreciation with the name of the veteran they honored with a memorial brick. For more information about buying a memorial brick, go to the Memorial Brick Order Form. All proceeds go to SCV heritage preservation projects and to maintain and improve this monument to Confederate Veterans.